The Helena-Lewis and Clark National Forest burns slash piles recently near York following the 35-day partial government shutdown. Slash piles burn near York. Local U.S. Forest Service officials still are assessing impacts from the recent 35-day partial government shutdown, but say they appreciated community support while navigating uncertain times. 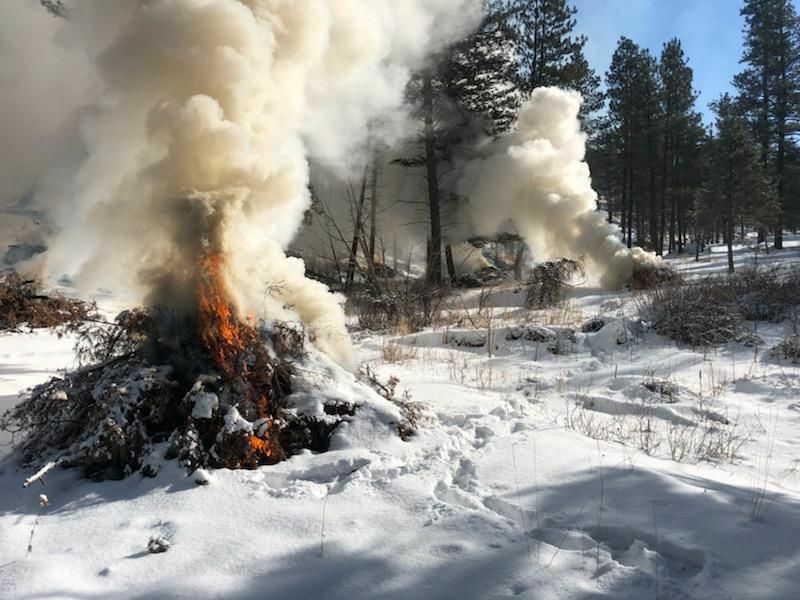 Columns of smoke have risen over the last couple of weeks near York as the Forest Service burns slash piles from months of thinning projects. 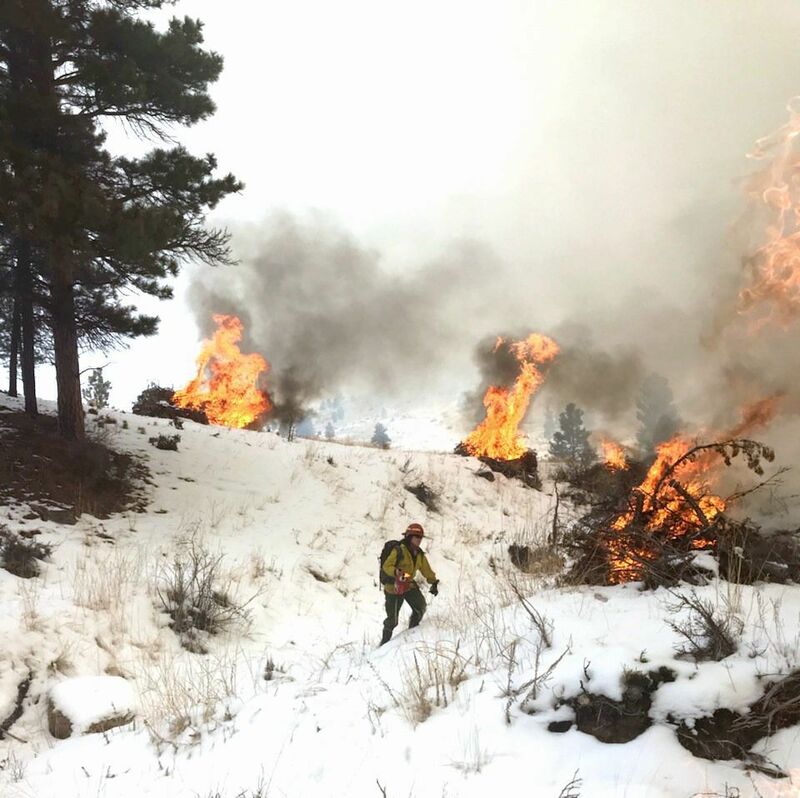 With furloughed staff, burning could not take place during the lighter snow month of January, and now crews are battling the elements to catch up. “We’re still assessing those impacts but I would sum it up pretty simply, you have 12 months in a year and lose a month’s worth of work, you’re not going to get a year’s worth of work in 11 months,” said Bill Avey, supervisor for the Helena-Lewis and Clark National Forest. The shutdown affected employees differently across the Forest Service. Certain staffers, such as law enforcement, were classified as “excepted” from the shutdown. They worked without pay and other officials such as district rangers continued working to ensure public safety, he said. The length of the shutdown was stressful for many employees. Most staffers earn between $40,000 and $50,000 per year, which Avey notes is a solid wage in Montana but square within the middle class. “Certainly that level of uncertainty causes stress,” he said. “When people don’t know if you’re going to get back paid initially, if it’s going to end, how long that is, but I’d add that it’s a stress people feel in the private sector as well. The Forest Service did have carry-over funding for timber and fuels projects. That allowed some timber sales and fuels reduction work to continue, which Avey called “critical” to both resource management and for local timber economies. Although timber and fuels employees would have been paid under the existing funding, the time it took for payroll to catch up meant they received paychecks at about the time the shutdown ended, said Kathy Bushnell, Forest Service public affairs officer. A public comment period for the Stonewall Vegetation Project near Lincoln ended during the shutdown, which Avey says will be extended. The agency was also able to staff some recreation employees to facilitate cabin reservations, but they also went without pay during the shutdown. “Part of this was, I mean it was such an unprecedented length and a dynamic situation as the events unfolded for us, there certainly wasn’t a guidebook on how to react to this,” Avey said. While Forest Service workers' pay will be made whole, the same is not true for contractors, he said. In one case, a district ranger office took up a collection and gave the money to their janitorial contractor. During the shutdown, a number of businesses and nonprofits offered help to furloughed federal workers. That included banks, which pledged help with finances, to breweries and restaurants serving up specials. Helena Food Share also publicized its services for federal workers, although Avey is unsure if anyone from the Forest Service utilized them. When they came back to work, the agency did a “welcome back” food drive with plans to deliver the food on Friday. Cheri Ford, supervisor of the Beaverhead-Deerlodge National Forest, shared a similar sentiment about the community outpouring for furloughed staff, calling the response “overwhelming” in a thank-you letter. “Your support to employees and their families demonstrated that they are truly part of your community family,” she wrote. “While it is not a surprise that rural Montanans would take care of each other, we recognize and thank each of you for your support and patience while we were furloughed.